Spyder's Web ran on ITV from January-April 1972 and concerned an undercover spy agency led by Charlotte Dean (Patricia Cutts). Reporting to Whitehall but operating under the guise of film company "Arachnid Productions", her second-in-command was army veteran Clive Hawksworth, played by Anthony Ainley. Although spoilers are largely avoided, some plot elements are discussed as part of this article... some of the images from this post-watershed series may also be unsuitable for younger readers. 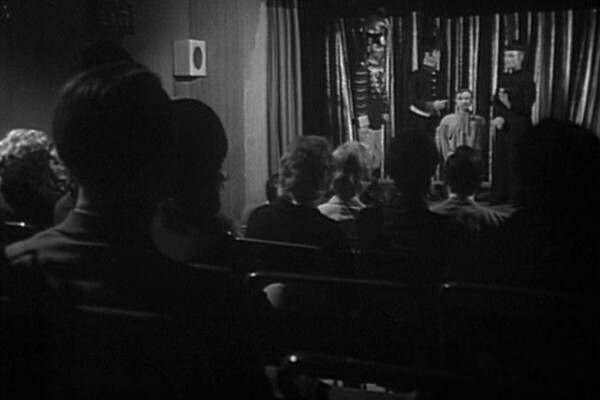 Unusually for an ITV show, Spyder's Web isn't well represented in the archives. While every episode still exists, only two of them are still retained as colour copies, with the rest in black and white of varying sound and picture quality. With Things That Go Bang in the Night then it's something of a shame that the episode in the best condition is also the worst. Featuring broadly-written, money-grabbing relatives of a deceased man, this coincidentally aired 11 days after the similarly-themed Steptoe and Son episode Oh, What a Beautiful Mourning. The difference here is that the "final possessions" include the invention of a new explosive, which is fairly inspired, but does get sillier as it goes on. The main selling point of Spyder's Web was its cast. At the time of airing, secretary Wallis Ackroyd (Veronica Carlson) would have been the most familiar face, having appeared in many Hammer Horror movies, including Frankenstein Must Be Destroyed and Dracula Has Risen From The Grave. In modern terms then studio aide Albert Mason is played by Roger Lloyd-Pack (aka Trigger from Only Fools and Horses) and Ainley is most familiar to cult TV fans as the Master in 1980s episodes of Doctor Who. 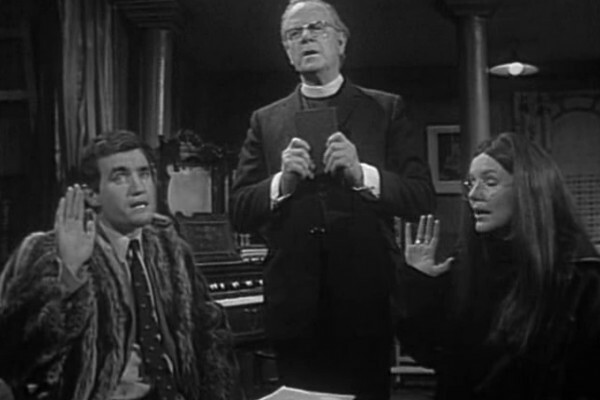 The sole episode of writer Frank Driscoll, Life At A Price is a little more straightforward than most of the other episodes present, lacking the series' left-field plotting and semi-spoof leanings. 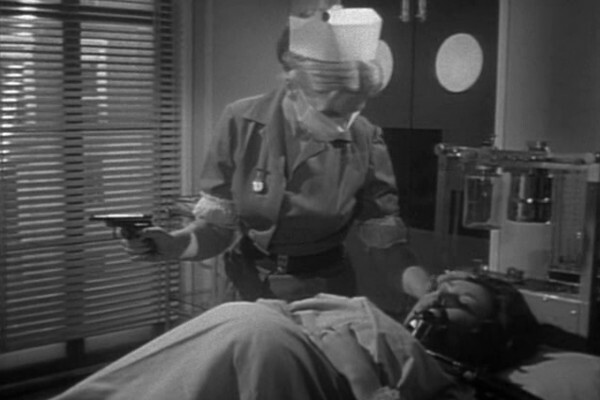 Driscoll's only other drama script was a co-writing credit on the 1956 film Johnny You're Wanted, 15 years before this episode was made. His work in the interim had been six years working on short documentary scripts for the Look At Life series, making him an odd choice for a spy series. This isn't to say that this episode doesn't have its moments, and there are some offbeat charms like the increasingly surreal way the unseen boss of Spyder communicates... here sending the duo 97 nappies as a code. The episode does suffer from English actors doing "foreign" accents, something that sadly plagued every episode that aired in February (Romance on Wheels/The Hafiz Affair/Emergency Exit). While a series as knowingly campy as Spyder's Web can maintain its sense of form even with some wildly OTT "foreign" accents, having an entire four weeks of it back-to-back does put a strain on the viewer if these are watched in broadcast order. Mostly, though, this is a fine, engaging episode, its low placing only because it's not quite as good as 11 others. For trivia fans, then this is the shortest episode, coming in at 47'35m, significantly behind the longest, The Executioners, which lasts for 51'53m. While Spyder's Web is arguably the most obscure programme to be covered on this site to date, it was actually a sizeable hit at the time it aired. The ratings ranged from the 5-7 million range, which may sound a lot less than reported viewing figures from other series, but complications rely on the way the figures were recorded back then. While there's still no concrete way to accurately assess how many people in the UK watched a particular programme, back in the 1970s ITV were using JICTAR to calculate how many households were watching a TV show, whereas the BBC, doing their own research, were looking at members of the household. Consequently the ratings referred to above would have been in the 11-15m range by the BBC's standards of surveying. A far better indication is the chart position for the series, which had it as a top twenty programme for all but three instalments. 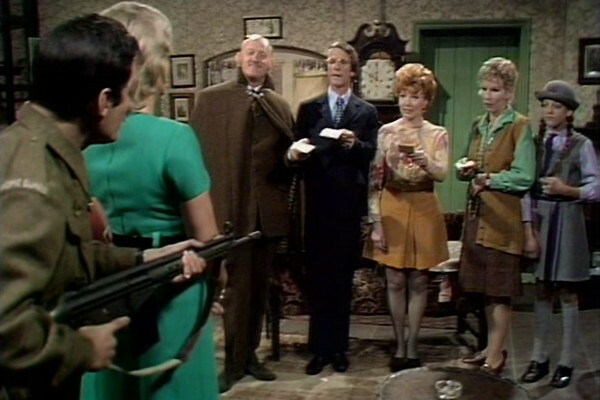 The series aired on Fridays at 9pm, and while the narrative today is that it's a forgotten programme, at the time it was broadcast it was reasonably popular, sometimes even one of the ten most-watched series of its day, and even occasionally out-rating established, regarded series like Callan. (It's also notable that the weeks where the series didn't chart coincided with weeks where television was broadcasting the winter Olympics and the FA Cup Semi-finals). This particular episode got a comfortable 6.25 million homes tuning in (c. 13.75m viewers), as well as a joint 18th chart position. While that might not seem a huge success, it does mean that this episode of Spyder's Web was a bigger hit than any episode of Doctor Who that Ainley appeared in, where his highest peak was a 26th placing for an episode of Time-Flight. As for the episode itself, then there's some invention here with a tale of life-sized puppets from an avant-garde theatre production being used to house Russian spies. However, the infectious interplay between the leads doesn't seem to rub off on guest star Mark Eden, with both Ainley and Cutts seeming to miss cues with him, if only for an instant. Consequently it doesn't possess the same energy as some of the better episodes, though the rushed production rate can be gleaned by a late scene where Cutts utters "good eeee... morning, Doctor Dolek." A clever plot involves Spyder capturing a KGB agent, who is to be turned over to the CIA... but letting him be rescued so that they can follow his escape route. Tension is brought about by Ainley's ruthless Hawksworth being desperate to shoot the man in the name of patriotism, and Cutts's focussed Lottie Dean refusing to divulge his location to ensure his safety. Spyder's Web is a comedic show, but often that comedy is a little subversive and left-field. 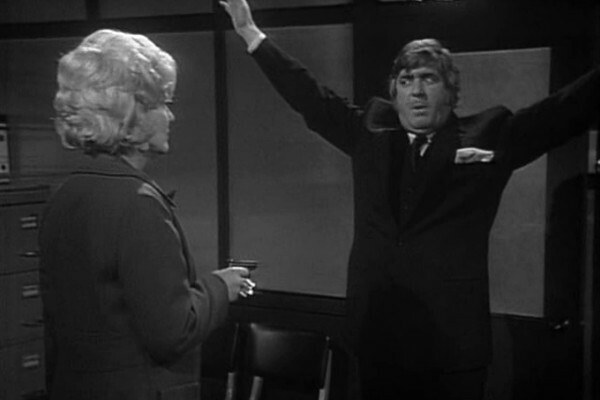 Many of the lower-rated episodes here have humour that is more "obvious" and broad, as evidenced by Barry Linehan's somewhat OTT performance as the main Russian, pictured above. The idea for Spyder's Web was dreamt up by television writer Richard Harris, the creator of Man in a Suitcase and, later, Shoestring. Although Harris didn't write any of the episodes, he created the title and rough outlines of the characters, while Roy Clarke developed them further and wrote five of the episodes. Generally a witty writer at his best, this is the weakest of Clarke's efforts for the programme, featuring Mike Pratt as a Latin American revolutionary. The plot stands up reasonably well, and there's a nice left-field subplot where Pratt takes part in a jungle drum-led chicken-and-naked-woman Satanic sacrifice for almost next to no reason. Sadly, where it falls down is in slightly undermining Cutts's character, with Pratt a former lover who brings out her softer side. The character of Charlotte Dean was quite a progressive one for the time, running rings around Hawksworth and being business-like in her missions, a sharp contrast to the usual submissive roles in genre television. Yet some of the later episodes do soften her, introducing more traditionally "feminine" qualities to her hard-nosed character. Even Tolstoy-loving secretary Wallis, often demeaned by other characters due to her physical appearance, is presented as an intellectual. While the "joke" that she's regarded by others as an idiot because she's sexually appealing may seem patronising and thin in 2017, one only has to look at the far more one-dimensional characterisation of a secretary in serious peer Doomwatch to realise this was a reasonably challenging depiction of women on 1970s TV. As Hawksworth tells Dean in Lies and Dolls, "You know, you should have been a man, then you'd be running Scotland Yard." "Discrimination, ain't it?" quips Dean. Another Roy Clarke episode, and there are clearly two Roy Clarkes: one a witty, philosophical writer, and the other a man who made mileage out of bathtubs down hillsides and women whose surnames sounded like garden implements. Although this last episode leans sadly towards the latter, it's not without its more inspired moments, such as a Monopoly-style game for terrorists. It also contains the biggest roles for the two studio aides, Wallis and Albert. As there's no real narrative progression in the series (episodes reputedly being filmed in a different order to that broadcast) then we never really get to find out much about this couple. Although Albert's intentions towards Wallis are never particularly honourable, and he objectifies her (the first episode sees him remark that her breasts are "worth two A-Levels by themself") she does appear to be falling for him here. Although more than one episode (notably The Hafiz Affair) sees them admit they know more is going on with "Arachnid Productions" than they let on, here they're left in little doubt as the finale sees Hawksworth and Dean blow up a collective of terrorists and gangsters. Hawksworth even consolidates the vague tension between himself and Dean by planting a kiss on his hand and placing it on her face. There was a lot of potential still left in the series, and the audience to justify it... sadly a second season was never made.